With Chernobyl's nuclear radiation raining down, Communist party officials dithered, delayed and hid the truth. Then they gave residents of nearby Prypiat 50 minutes to evacuate. In the early hours of April 26, 1986, the world witnessed the worst nuclear catastrophe in history. A reactor at the Chernobyl nuclear plant in northern Ukraine exploded, spreading radioactive clouds all over Europe and a large part of the globe. In all, 50 million curies of radiation were released into the atmosphere—the equivalent of 500 Hiroshima bombs. 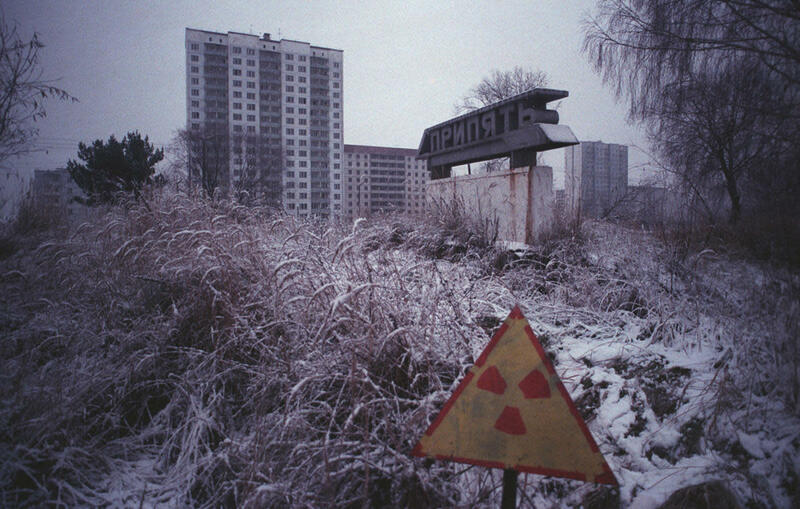 In this exclusive excerpt from Chernobyl: The History of a Nuclear Catastrophe, we witness the dramatic exodus from Prypiat, a city of 50,000 located a few miles from the damaged reactor. 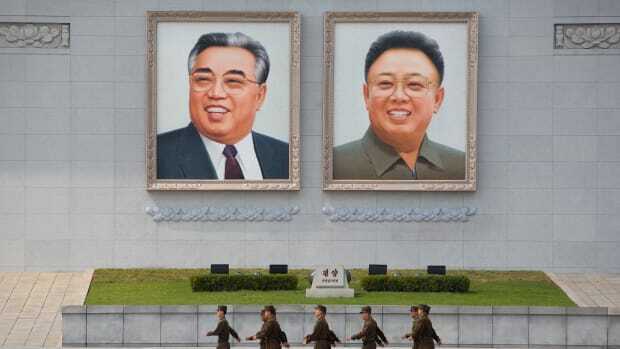 The call came around 5:00 a.m. on April 26, awakening the most powerful man in the land, the general secretary of the Communist Party of the Soviet Union, Mikhail Gorbachev. The message: There had been an explosion and fire at the Chernobyl nuclear power plant, but the reactor was intact. “In the first hours and even the first day after the accident there was no understanding that the reactor had exploded and that there had been a huge nuclear emission into the atmosphere,” remembered Gorbachev later. He saw no need to awaken other members of the Soviet leadership or interrupt the weekend by calling an emergency session of the Politburo. Instead, Gorbachev approved the creation of a state commission to look into the causes of the explosion and deal with its consequences. Boris Shcherbina, deputy head of the Soviet government and chairman of the high commission, was summoned from a business trip to Siberia and sent to Ukraine. He arrived in Prypiat, the town that housed the construction workers and operators of the nuclear plant, around 8:00 p.m. on April 26, more than 18 hours after the explosion. By that time very little had been done to deal with the consequences of the disaster, as no one in the local Soviet hierarchy dared to take responsibility for declaring the reactor dead. Shcherbina began a brainstorming session. Only then did everyone accept what had been unthinkable only hours earlier: A meltdown had occurred, and the reactor’s core was damaged, spreading radioactivity all over the place. Radiation Levels Rose. Bigger Blasts Loomed. Officials Dithered. The question was how to stop it from burning and producing ever more radioactivity. They bounced ideas off one another. Shcherbina wanted to use water, but they explained to him that dowsing a nuclear fire with water could actually intensify the blaze. Someone suggested using sand. But how to bring it to the reactor? Shcherbina had already called military helicopter and chemical units into the area. 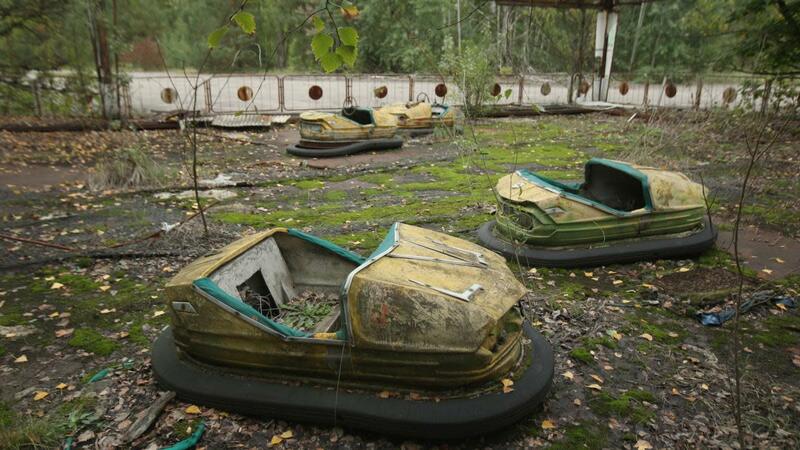 Their commanders were en route to Prypiat. Soon after 9:00 p.m., while the members of the commission were brainstorming, the reactor suddenly awakened. Three powerful explosions illuminated the dark red sky above the damaged reactor, sending red-hot pieces of fuel rods and graphite into the air. “It was a striking spectacle,” remembered one of the commission’s experts who observed the scene from the third floor of the Prypiat party headquarters, where the high commission was housed. It looked as if the worst-case scenario was now coming to pass. Earlier in the day, experts had predicted a possible chain reaction starting as soon as the reactor emerged from the temporarily disabling iodine well. The explosion might be the first indication of a much bigger blast to come: They had no choice but to wait and see. But even without further explosions, the newest ones put Prypiat citizens in greater danger. The wind suddenly picked up, driving radioactive clouds northward from the damaged reactor and covering parts of the city. Radiation levels increased on the city plaza in front of party headquarters in downtown Prypiat, rising from 40 to 320-330 microroentgens (a legacy unit measuring exposure to electromagnetic radiation) per second, or 1.2 roentgens per hour. Armen Abagian, the director of one of the Moscow nuclear-power research institutes who had been dispatched to Prypiat as a member of the government commission, approached Shcherbina and demanded the city be evacuated. 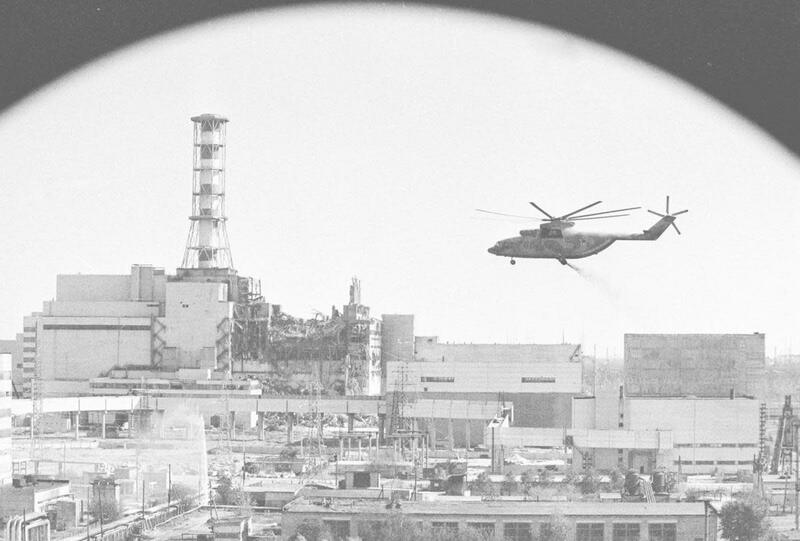 Abagian had just returned from the plant, where the explosions in the reactor had caught him unawares—he and his colleagues had had to seek shelter under a metal bridge. “I told him that children were running in the streets; people were hanging laundered linen out to dry. And the atmosphere was radioactive,” remembered Abegian. But according to government regulations adopted in the Soviet Union back in 1963, evacuation of the civilian population was not necessary unless the radiation dose accumulated by individuals reached the 75-roentgen mark. Calculations had shown that with the existing level of radioactivity, the intake might be about 4.5 roentgens per day. With the official threshold not yet met, Yevgenii Vorobev, the commission’s senior medical officer, was reluctant to take responsibility for ordering an evacuation. As the commission dithered, people began leaving the city. Intercity telephone networks had been cut and the engineers and workers at the nuclear plant had been prohibited from sharing news of what had happened with their friends or relatives. But the family and informal networks that had always served Soviet citizens better than state-controlled media quickly activated in Prypiat, circulating rumors about the power-plant accident within hours after the explosion. The city of Prypiat was slowly awakening to the reality of the disastrous accident in its backyard. Liudmila Kharitonova, a senior engineer in a construction firm, was on her way to her country house—a dacha—nearby when she and her family were stopped by police. They had to turn back to the city, where Liudmila saw foam on the streets—roads were being treated with a special solution by water trucks. In the afternoon military personnel carriers appeared on the streets, and military planes and helicopters filled the sky. The police and military were wearing respirators and gas masks. Children returned from school, where they had been given iodine tablets, and were advised to stay indoors. It was close to midnight on April 26 by the time Abegian and other scientists managed to convince Shcherbina to order an evacuation. But Shcherbina’s decision needed approval from above. “They told one [party] secretary, and he said: ‘I can’t give you my agreement to this,’” recalled one of the participants of the meeting. “They got through to another who also expressed sympathy but said that he could not give his assent.” Eventually Shcherbina phoned his boss, Premier Nikolai Ryzhkov. “Shcherbina called me on Saturday evening,” recalled Ryzhkov, “and reported on the situation. ‘We’ve measured the radiation… Prypiat has to be evacuated. Immediately. The station is close by, and it’s emitting radioactive contagion. And people in the city are living it up full blast; weddings are going on…’ I decided: ‘Evacuation tomorrow. Prepare trains and buses today and tell the people to take only the bare necessities.’” By 1:00 a.m. on April 27, local officials in Prypiat had received an urgent order from Shcherbina to prepare lists of citizens for evacuation. They were given two hours to do the job. 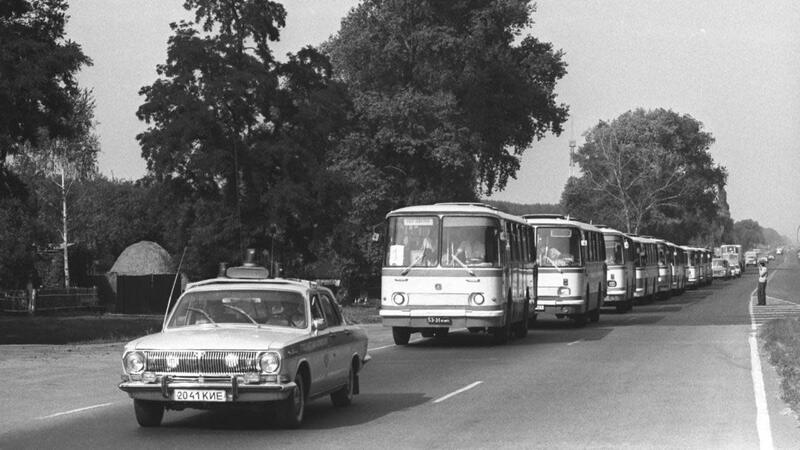 The columns of buses that had been waiting on the roads between Chernobyl and Prypiat for hours, absorbing high levels of radiation, began to move at 1:30 a.m. on the morning of April 27. Levels of radioactivity in the city were rising quickly. On April 26 it registered in the range of 14-140 milliroentgens per hour, but by about 7:00 a.m. on April 27 it had risen to between 180 and 300 milliroentgens; in some areas close to the nuclear plant, it approached 600. 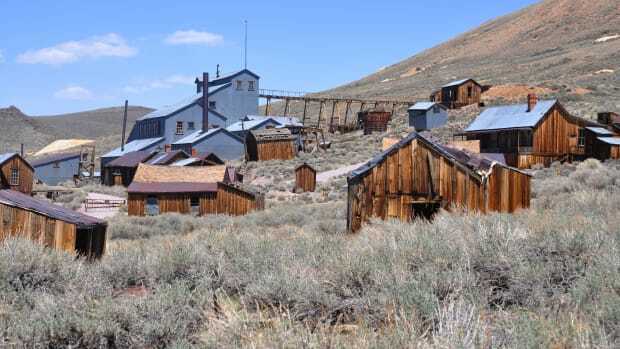 The original plan was to begin evacuation on the morning of April 27, but officials decided too late to meet the deadline. They pushed the evacuation to the early afternoon. To some Prypiat citizens, the evacuation came as a long-awaited relief, to others as surprise. Prypiat city radio transmitted the announcement soon after 1:00 p.m.
For 36 hours after the explosion, people were given no reliable information about it and left virtually on their own. They never received instructions on how to protect themselves and their children. 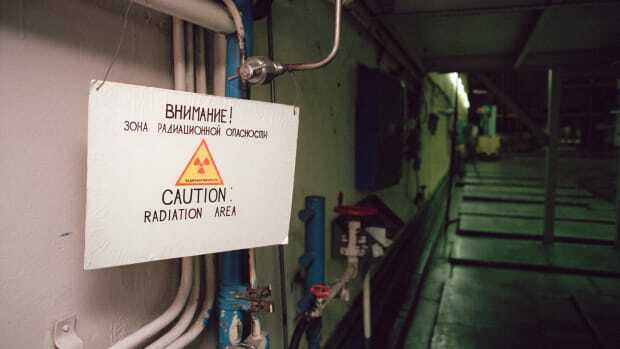 Radiation levels that according to Soviet laws were supposed to trigger an automatic public warning about the dangers of radiation exposure had already been recorded in the early hours of April 26—but were ignored by one official after another. Finally, people were asked to gather their belongings and wait on the street a mere 50 minutes before the start of the evacuation. They were good citizens and did exactly what they were told to do. Liubov Kovalevska, a local journalist and the author of the recent article about quality-control problems at the construction site of the Chernobyl nuclear plant—which was ignored by the authorities—was among the thousands who boarded buses that afternoon, never to return to their homes. She had spent a good part of the previous night calming her elderly mother, who could not sleep after hearing rumors about imminent evacuation. Now their whole family was ready to leave. They were told that it would only be for three days. A film shot on April 26 and 27 by local filmmakers preserves images of a wedding taking place in the city attacked by radionuclides. It shows young men and women dressed in light summer clothes with their small children, walking the streets, playing soccer on sports grounds and eating ice cream in the open air. These scenes look surreal when juxtaposed with others shot by the same filmmakers: water trucks cleaning the streets, policemen and soldiers in protective gear atop troop carriers patrolling the streets of Prypiat and people waiting for buses that would take them away from their homes. One frame shows a doll on the window sill of an apartment building, seemingly waiting for its owner to return. Sparks and white flashes in the film frames reveal the true meaning of what we see on the screen. These are scars left by radioactive particles attacking the film through the thick lenses of the camera. The Chernobyl filmmakers kept shooting, their last frames coming from the windows of departing buses. 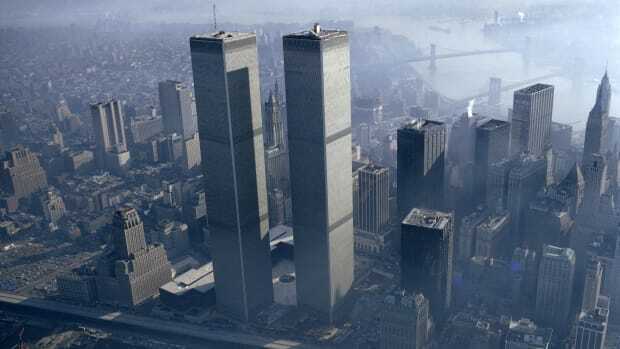 Theirs turned out to be the last images of the city still full of people. By 4:30 p.m., the evacuation was all but complete. The authorities were eager to report their first success to Moscow. “Shcherbina called at lunchtime on Sunday,” recalled Premier Nikolai Ryzhkov. He told the premier: “There are no people left in Prypiat. There are only dogs running around.” (People had not been allowed to take their pets.) A few days later, the police would create special squads to kill stray dogs. But canines were not the only ones remaining in Prypiat. Close to 5,000 workers of the nuclear plant stayed to ensure that the shutdown of the other reactors proceeded as planned. Young lovers took advantage of their parents’ departure to have their apartments to themselves. Finally, there were the elderly who decided to stay behind. They could not understand why they had to leave when the evacuation was for three days only. They did not know they would be leaving forever. The evacuees brought not only their irradiated bodies, but also their contaminated clothes and personal belongings to their temporary homes. The next day, KGB officials informed Ukrainian party authorities that of the nearly 1,000 evacuees who had moved to towns and villages of nearby Chernihiv oblast on their own, 26 had been admitted to hospitals with symptoms of radiation sickness. The KGB was busy curbing the “spread of panicky rumors and unreliable information,” but could do nothing about the diffusion of radiation. With the evacuation of Prypiat and nearby villages complete, the buses returned to Kyiv. They were assigned to their regular routes, where they spread high levels of radiation around the city of 2 million. 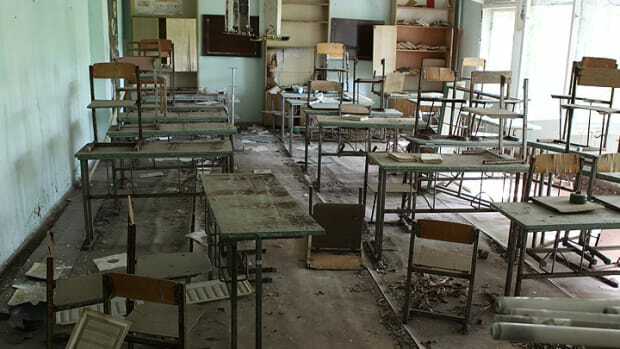 After the central party leadership refused to cancel a huge May Day parade in Kyiv, despite evidence of increasing levels of radiation, hundreds of thousands of schoolchildren were subsequently evacuated from that city as well. 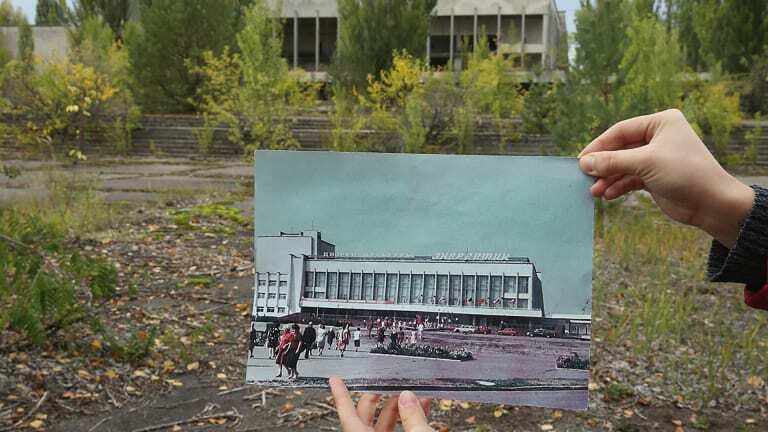 Unlike the citizens of Prypiat, they would be allowed to return home in the fall of 1986. 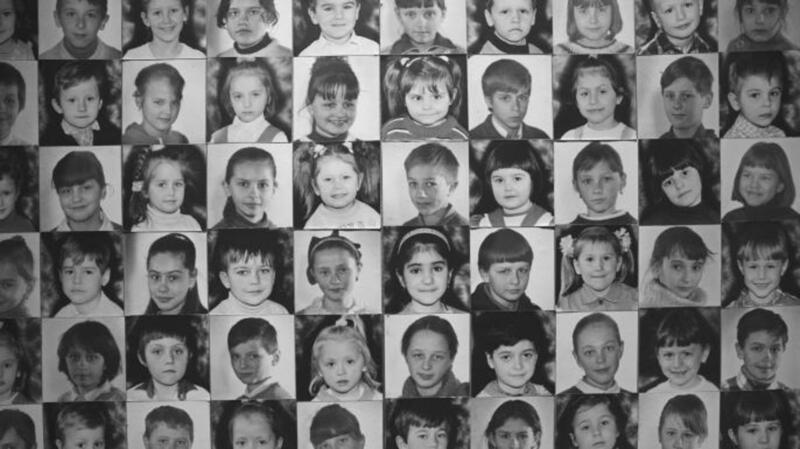 While only a few dozen people died as a direct consequence of the explosion and radiation poisoning, the World Health Organization puts the number of cancer deaths related to Chernobyl at 5,000. More than 50,000 square miles of territory were contaminated in Ukraine, Belarus and Russia. In April 2016, when the world marked the 30th anniversary of the disaster, there was a temptation to breathe a sigh of relief. The half-life of cesium-137, one of the most harmful nuclides released during the accident, is approximately 30 years. It is the longest “living” isotope of cesium that can affect the human body through external exposure and ingestion. Other deadly isotopes present in the disaster have long passed their half-life stages. But the accident’s harmful impact is still far from over. With tests revealing that the Cesium-137 around Chernobyl isn’t decaying as quickly as predicted, scholars believe the isotope will continue to harm the environment for at least 180 years—the time required for half the cesium to be eliminated from the affected areas by weathering and migration. Other radionuclides will perhaps remain in the region forever. The half-life of plutonium-239, traces of which were found as far away as Sweden, is 24,000 years. Serhii Plokhy is the professor of history at Harvard University and the director of the university’s Ukrainian Research Institute. He is the author of numerous books, most recently, Lost Kingdom: The Quest for Empire and the Making of the Russian Nation and Chernobyl: The History of the Nuclear Catastrophe.